When someone asks me to join them in Morocco to cook and explore I find that I can never say no. 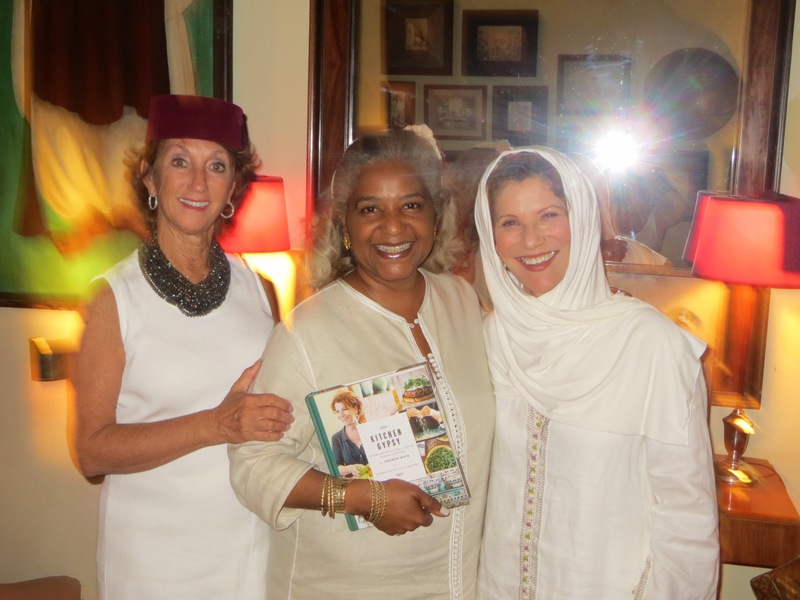 Last spring the amazing chef, cookbook author and tv personality, JOANNE WEIR, www.joanneweir.com, suggested I join her group in Morocco for a week. That is how it all began. 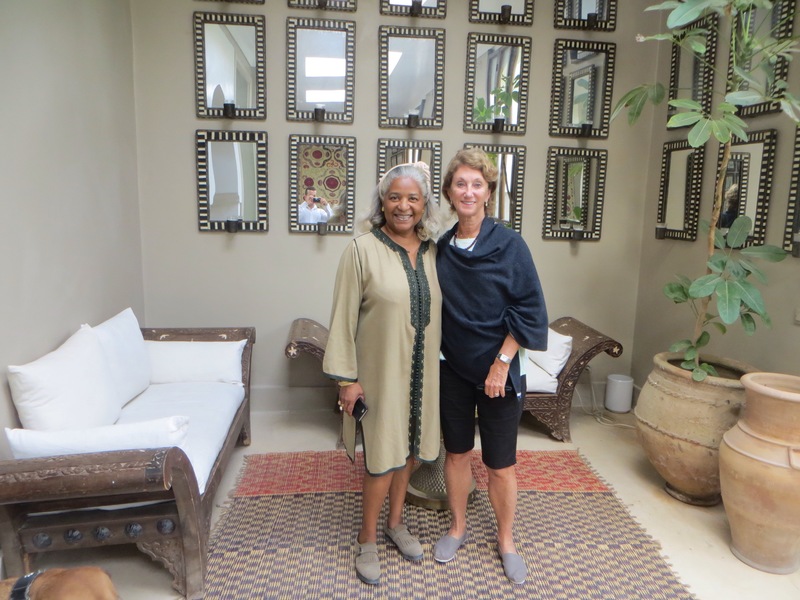 On Monday 10/21/15 I arrived at the beautiful compound in Marrakech called Jnane Tamsna, owned by Meryanne Louin-Martin and her husband Gary. Jnane Tamsna, http://www.jnanetamsna.com, is located about 15 minutes outside of the main city of Marrakech, our home of the next week. This amazing walled garden is the perfect place to return to each day after the hectic noises and sights of the medina. Monday night we gathered in the main building to meet the rest of the guests. This building is like a small hotel plus there are 2 houses on the grounds a total of 25 unique bedrooms, plus 5 large swimming pools. Joanne energizes her group of 18 guests that would spend their mornings cooking in the beautiful outdoor classroom and then sit down to lunch in the garden to enjoy the dishes we created . Joanne gave each of us a packet of recipes and beautiful new aprons and began to tell us all the exciting adventures we would experience in the next week. Tuesday morning we cooked our first tagines, these were small personal tagines that we would enjoy for lunch. Half of us did a lamb tagine with preserved lemons and the others made chicken with dried fruit. 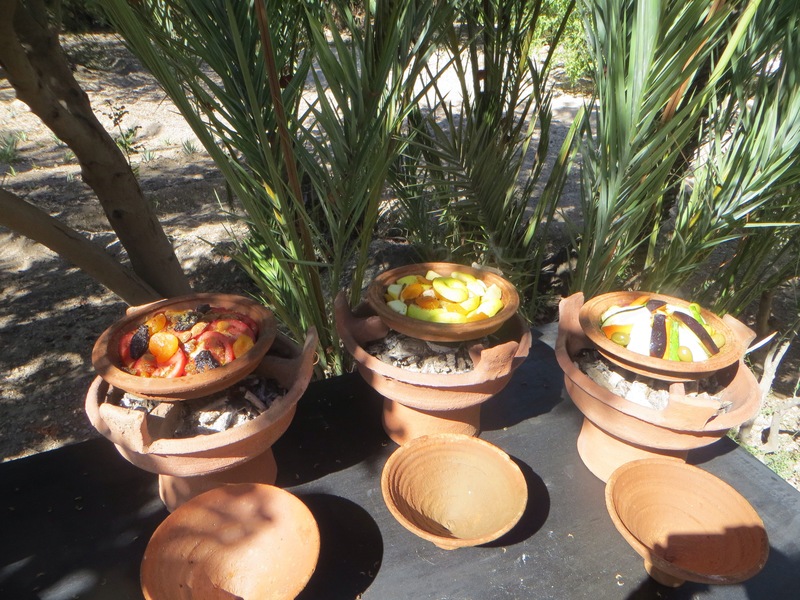 Each tagine was set on a brazier for an hour while we wandered into the garden where tables had been set up for our lunch. 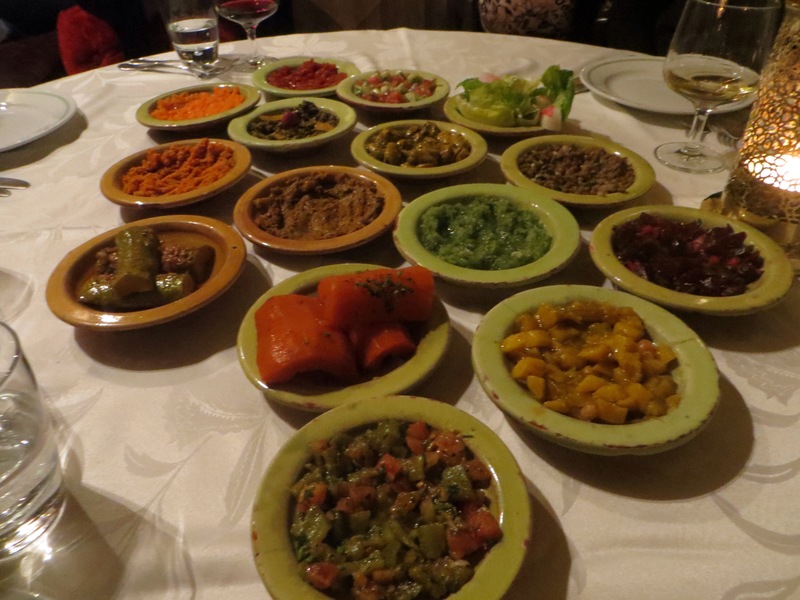 We each got our personal tagine placed in front of us along with lovely salad and of course a glass of local rose. After our lunch a few of us went to Maison de Zoe to order beautiful linens and cotton bathrobes, 366 zone industrelle de Sidi Ghanem. 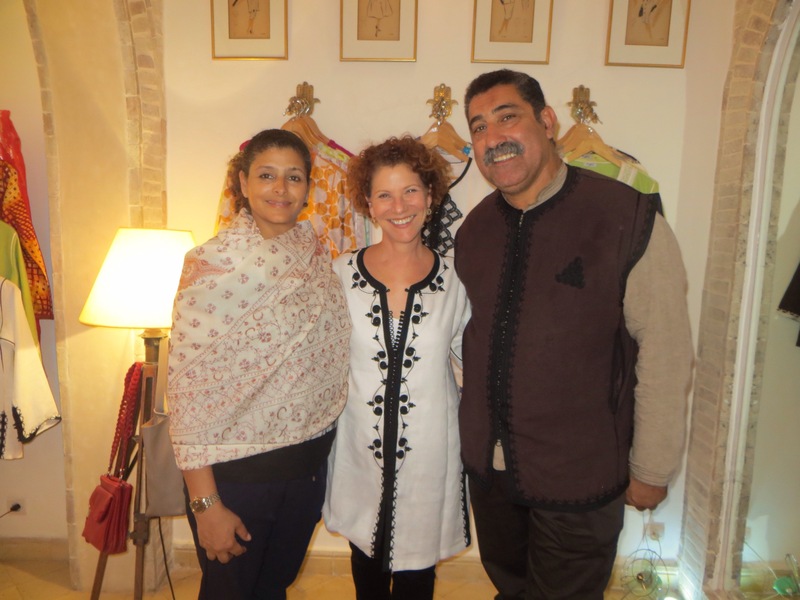 Zoe also has a small boutique in La Mamounia Hotel. 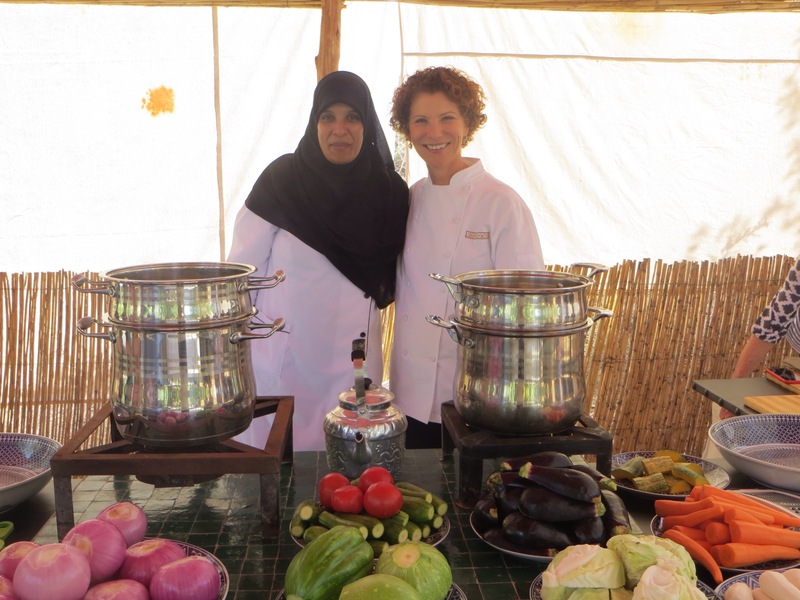 Each morning chef Bahija and Chef Joanne Weir were ready with our list of recipes and all the ingredients we needed to prepare our dishes for our lunch. Everyone gathered with knives in hand cooking together with only a break for our morning tea to be served. After another beautiful lunch we would venture out into the markets to explore and of course shop for our individual treasures. We were met by our amazing guide ( ABOUL, mohmoudtours@yahoo.fr ) his card says expert on shopping, shipping and history of the country. If you want the best guide in Merrakech ABOUL is the one to contact, cell 00212 (0) 661 173 971, in advance. He helped us bargain for great prices, he took the group that wanted carpets to a warehouse with an amazing selection showing the patience few men have. 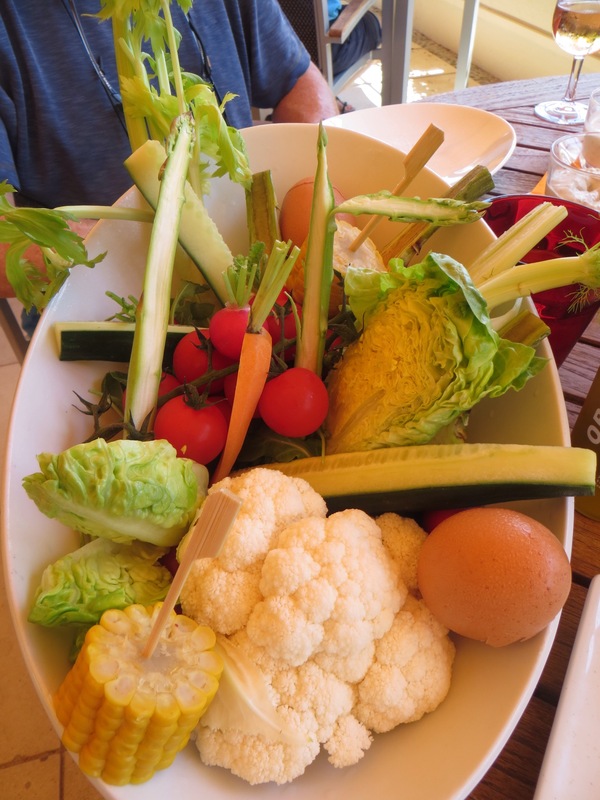 For lunch in the medina look at “La Table du Palais” with a bountiful garden behind it walls. Love the Caftan store next door, “Maison Du Caftan, 65 Rue Sisi El Yamani.” Something for everyone and great prices and quick alterations if something did not quite fit. After crazy shopping, buying spices, saffron and argane oil we headed back to change for dinner. then when the roasted meat arrives you are sure you will never finish the whole plate, but it seems to disappear. Make reservations, 002120 524383839, M. Fatiha will take great care of you. The next day ABOUL took everyone to an amazing upscale shop “AYA’s 11 Bis, Derb Jdid Bab, next door to restaurant Tanjia. This is the place to buy top quality Moroccan style clothing, jackets, dresses and accessories. After all the shopping we headed to “El Fenn” at sunset for drinks on the roof, http://www.el-Fenn.com, worth the stop. We then walked to dinner at “La Patisserier”, I would like it better for lunch since the view over the Medina from the roof would be wonderful. Friday we did not cook instead we went to the wonderful spice gardens called “Nectarome”. Nectarome is about and hour out side of Merrakech toward the Atlas Mountains. Interesting place that has developed over the past 6 years and now is selling their products at retail is several locations, Jnane Tamsna had the shampoo in the showers. 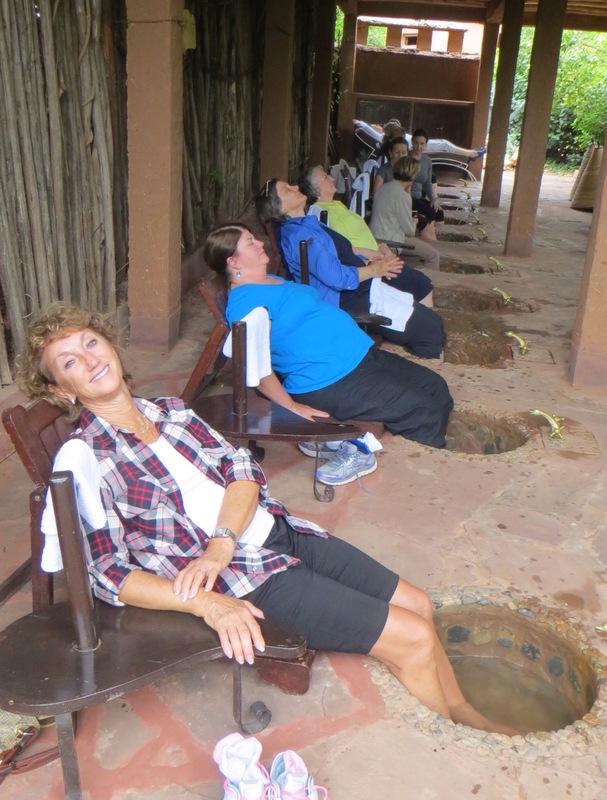 After our lunch in their garden several of us enjoyed a 20 minute foot soak in their unique sunken footbaths with special salts. I fell asleep on the way home I was so relaxed. The other gardens that we visited when back in town was “Jardin Majorelle, the gardens of Yves Saint Laurent where his personal home is. The next day we made a quick trip to “Galerie des Tanneuns” I bought a beautiful blue suede shirt and several wallets for gifts. Their prices are great and if they don’t have your size they are happy to make it for you. Before dinner we went to La Mamounia for a drink in the garden, be prepared the martini was 19 Euro, but it is beautiful and worth the experience. Dinner that night was at a small restaurant called Nomad, back in the Medina. I would suggest it for lunch, trying to wander through the maze of alley ways at night is difficult. I had a simple piece of fresh fish, a nice change from all the tagines we had been eating. We spent our last day saying good bye to Marrakech, some people doing one last trip to the Souke for those little gifts to take back home. Some of the group just sat by the pool for the last bit of sun. The last evening we were invited for a magical dinner in the gardens surrounded by the many olive and citrus trees. 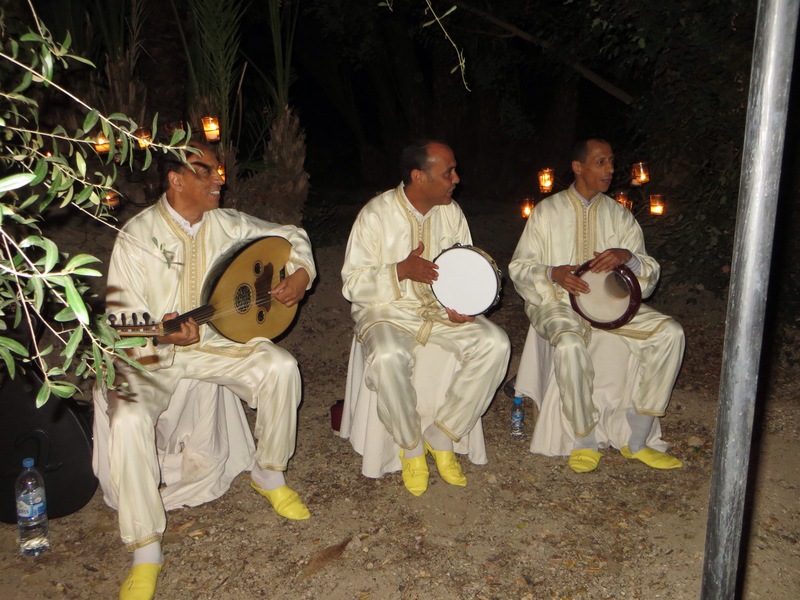 it is hard to say good bye to Marrakech especially as we sat under the stars and listened to the sounds of the night. Thank you Joanne of creating memories in one week we will all have with us for a lifetime. We arrived in Cannes and were greeted by our friends and hosts for 5 days of eating and exploring. Our friends have a wonderful condo a few blocks off the beach offering great views from a large deck. After we settled in and got organized we headed to the water front for an evening walk before sharing dinner on the deck and enjoying the sunset. Up early and off to the large local farmers market, off Rue Saint-George’s, and across the street from Saint-Lazard. This time of year the small melons are in season and a real treat since they are not common in the north west. We picked out local small peaches, figs, melons and apricots. Then loaded the baskets with veggies, olives, and cheeses and headed to the local bakery for bread. On our way back to the condo we stopped at Jean Luc Pele for amazing Chocolates, they have several shops in Cannes and a must visit. After dropping all our food stuff back at the condo we relaxed on the deck with a coffee and then headed to the beach front for a late lunch. Our friends favorite place is “La Plage 45”, across the street from Le Grand Hotel on the Croisette. The beach club sits in front of the lovely little restaurant and offers great people watching. The menu is fresh and offers a good selection of summer dishes along with a sushi selection. In the evening we had dinner reservations at “La Oasis”, 06210 La Napoule. The Oasis is a very high end restaurant located in a walled garden setting. The service was perfect with information on each item on the menu and also the extended wine list. There were several small chefs offering before we even ordered to wet our appetites. The portions are very generous so it works fine to share. 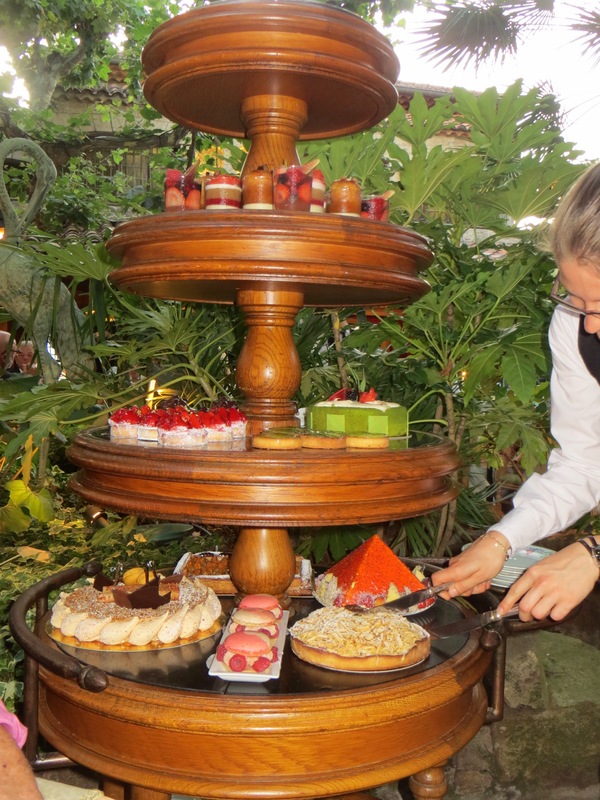 Be sure to leave room for the dessert trolley, it was over 6 feet high. Sunday morning we shared all our fruits on the deck and then late morning headed to the area over the hills called Grasse. We drove to the village of Cabris on the outskirts of Grasse for lunch on the patio of L’Auberge du Vieux Chateau. After lunch we went into the town of Grasse to visit the famous perfume shops, best known shop is Fragonard. Grasse has always been famous for the production of essence of flowers used in soaps, sachets and of course perfume. We spent the evening cooking a light supper at home and enjoying some of the chocolates we found at Jean Luc Pele. The next morning we got up early and drove 25 miles to Nice to attend the Anitque market. This is one of the largest of its kind in the south of France, located on Saleya street. You can find everything from silver spoons, full sets of silver in the original boxes to old books, Anitque linens and tools. We met a lovely man with a wonderful display of high end silver and glass pieces. We bought a full set of silverware from early 1900, all in perfect condition. Anitiquites 1900-1930 is owned and run by Mathieu, Mathieu.demyttenaere@gmail.com, he also can be found in St. Tropez on Saturdays. Mathieu packed and shipped all our silverware FedEx for us so we did not have to deal with customs etc. Following all our shopping we shared good pizza and a local bottle of wine at a restaurant on the same street called Le Safari at 1Cours Saleya, once again the portions were huge so plan on sharing. We walked to the new park that was finished last year when they built a cover over the river and brought in old growth trees for all over the area and built large scale play areas for families to share and others to read in the shade. Quiet dinner at home and a good card game ended another busy day in the Cannes. The next morning on our way to the old part of the city we wandered down Rue Hoche, a small walking street full of restaurants, bakeries, cheese shops. One of our favorites is Volupte, a tea store with a simple restaurant next door. Volupte serves a perfect cold mint tea that hits the spot on a hot day. We continued to walk toward the high point at the south end of Cannes, this was where the village began. As you climb the steep winding street to the top outlook you will pass several restaurants that will welcome you on your decent back to the port below. When we came back down we stopped at a beautiful French restaurant that had a few tables on the street for lunch. We chose “Relais des Semailles”, along Rue Saint Antoine. 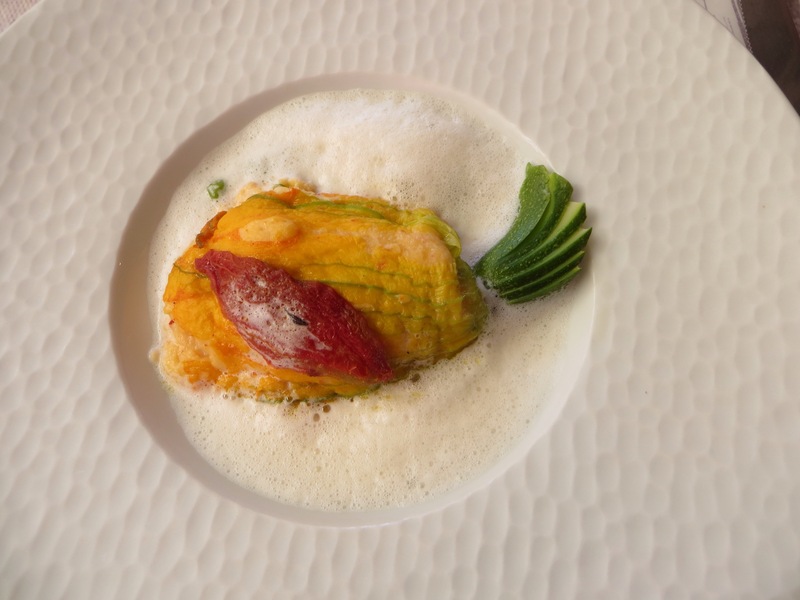 One of the great things about June is the abundance of preparations for stuffed zucchini blossoms, today mine were stuffed with crawfish mousse. The next morning we caught an early train to Antibes, an easy 20 minutes, upon our arrival we grabbed a taxi to the Picasso museum. This simple museum holding a group of Picasso drawings, photos of his time in Antibes and some of the pottery he produced during the few years spent in this walled beach front town. The total time needed including sitting in the sculpture garden is less than an hour. Since we had time before or lunch reservation we walked the little local food market, ate huge ripe cherries and wondered the small shops. Lunch time—- could not have come soon enough. We had reservations at ” Les Vieux Murs”, 25 Promenade Amiral de Grasse, next door to the Picasso Museum. This lovely restaurant is located at the top of the wall overlooking the sea. The menu is divided by price fix and ala carte. We chose to share fresh French bean salad with the most perfect green beans dressed with a light vinegarett and covered with fresh black truffles. The main course was suckling pig with a crisp skin and a light preparation of white fish, just the journey to the dessert. The windows were wide open to the fresh sea air and the finish of a lovely trip to Antibes. Back in Cannes for our last night we waited until 9 pm before we even began to think about another meal. We could not resist the warm evening on the water front and headed to the Croisette. We chose the happening pizza/Italian restaurant, Le Vesuvio at 68 Croisette. The pizza did not disappoint with a crisp crust and great toppings. The portions are very large for the salads and pasta so think of sharing everything. We had a great waiter and the crowd of people was entertaining for a fun crazy dinner to remember.